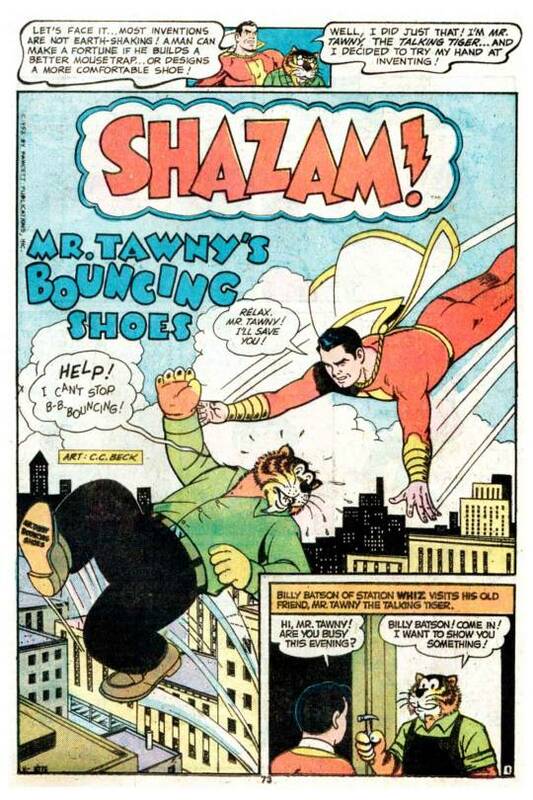 I have a vague memory of getting this issue of SHAZAM at my grandparents’ house, though I’m far from certain about that. But it does track to me–I was only a so-so fan of Captain Marvel at this point, but if the pickings were slim, the 100-Page format would have been a deciding factor in picking this issue up. And it’s a pretty fun book. As the cover promises, the lead story features the first meeting between the world of Captain Marvel and characters from DC’s regular Earth-1. Here, though, it’s played much more loosely than has typically been the case–though, as with Barry Allen having read about Jay Garrick in old comic books, we learn that Earth-1 publishes Captain Marvel comics as well, and Marvel’s world prints the adventures of Superman as well. 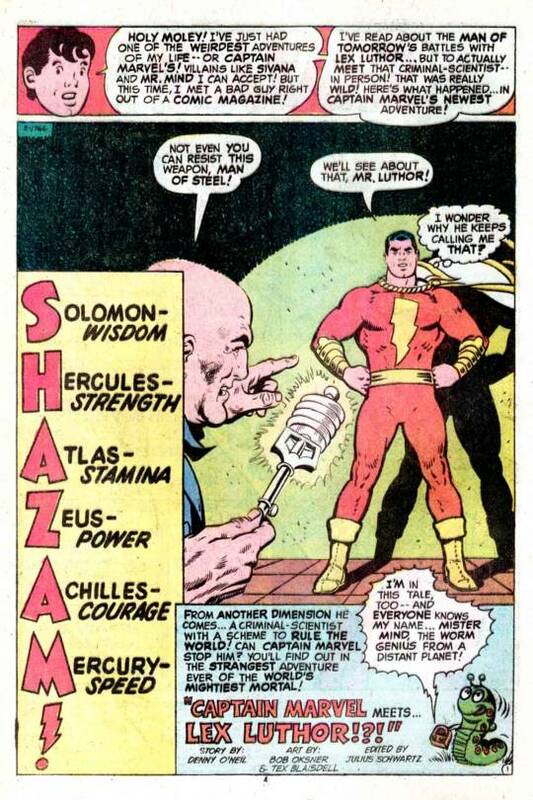 Seeking a test for his new weapon, a Magic Accumulator against which Superman will be powerless, Luthor turns it upon a copy of SHAZAM that some careless worker has left lying around, and finds himself transported into the world depicted within its pages. 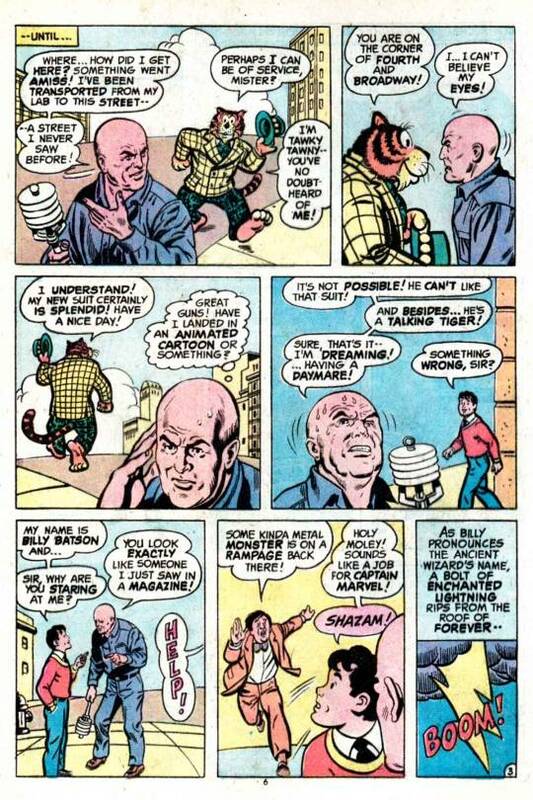 he swiftly encounters Tawky Tawny, Billy Batson and Captain Marvel, all the while decrying the silliness of his predicament. 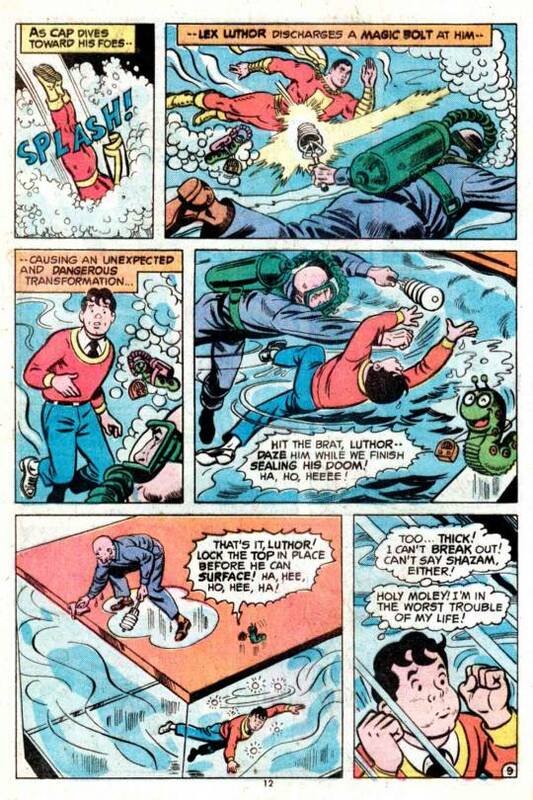 But its when Luthor is approached by Mister Mind that sparks really begin to fly. Mind recognizes Luthor from the comic book pages, and he proposes an alliance to conquer Captain Marvel. not having anything better to do in this animated world, Luthor agrees. First, they trick Billy into becoming Captain Marvel, allowing Luthor’s Accumulator to siphon off a portion of its magic power. Then, the lure the Big Red Cheese to a water tank that Mister Mind is in. When Cap pursues, Luthor unleashes the magic lightning, transforming him back into Billy, and they lock the top of the water tank atop him. It’s a really good trap, and Billy’s desperation seemed especially scary and genuine to me at the time. 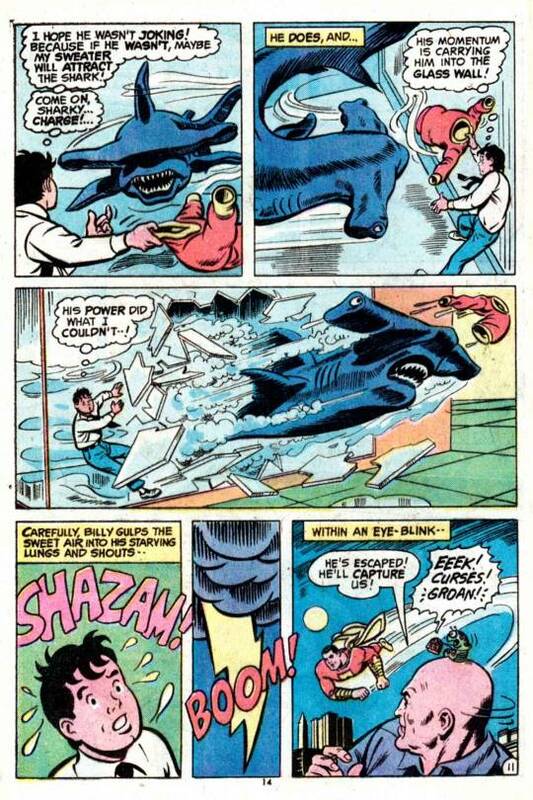 Unfortunately, the villains gild the lily–rather than letting Batson drown, they instead release a man-eating shark into the tank with him. Billy resourcefully tricks the shark into shattering the tank, and he is saved. 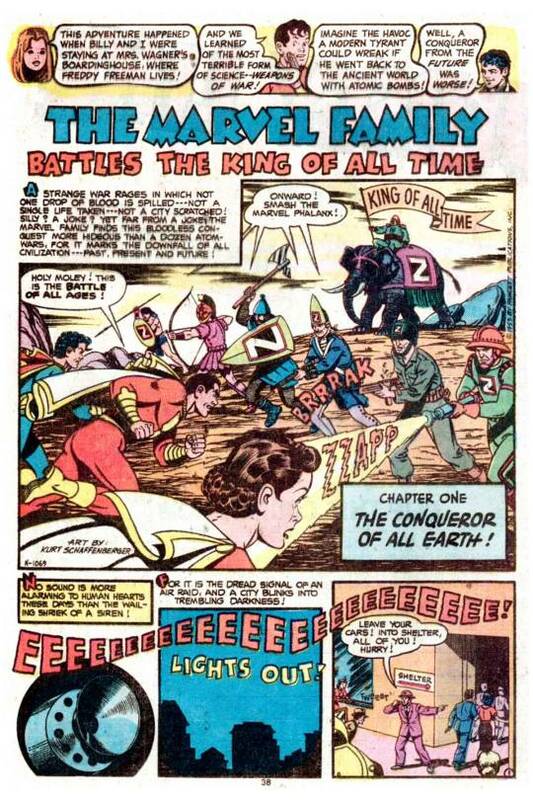 It takes Captain Marvel only seconds to catch up with the fleeing pair. 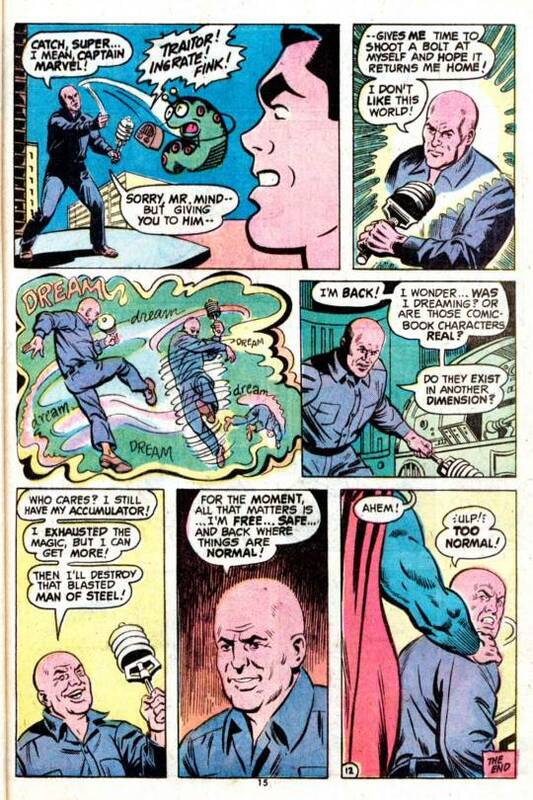 Throwing his partner to the wolves, Luthor uses his remaining charge to return to his home dimension, where, not certain if what he’s just experienced actually happened or was just a delusion created by the Accumulator’s discharge, he is swiftly captured by the already-waiting Man of Steel. Thereafter came the reprints. It was a bit of a mixed bag this time, beginning with a Mary marvel tale in which a homely girl used a chameleon hormone to try to become attractive, with mixed results. 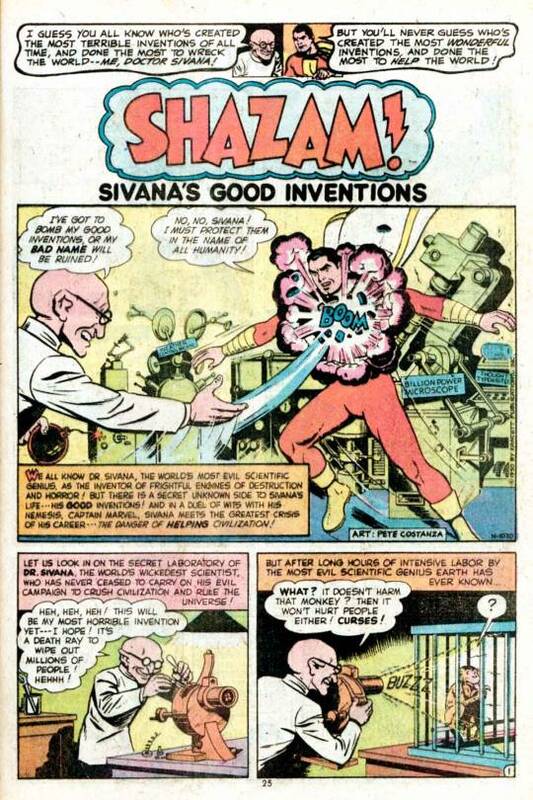 Better was the following story, which detailed Sivana’s attempts to destroy all of the beneficial inventions he’d accidentally created over the years while trying to manufacture weapons. Following that was a long Marvel Family adventure in which the trio of Marvels contended with a would-be world conqueror.from the future. 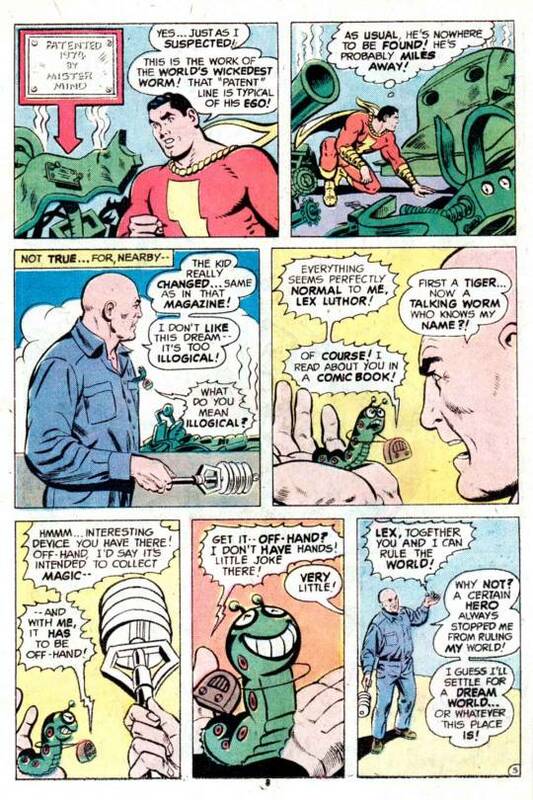 Thereafter, Captain Marvel contended with a computer with an abrasive personality. The next story was a harbinger to the Nutty Professor movies, as Tawky Tawny invents sneakers with super-rubber soles that begin to bounce crazily. There follows a Captain Marvel tale concerning a scientist who attempts to make progress go backwards. 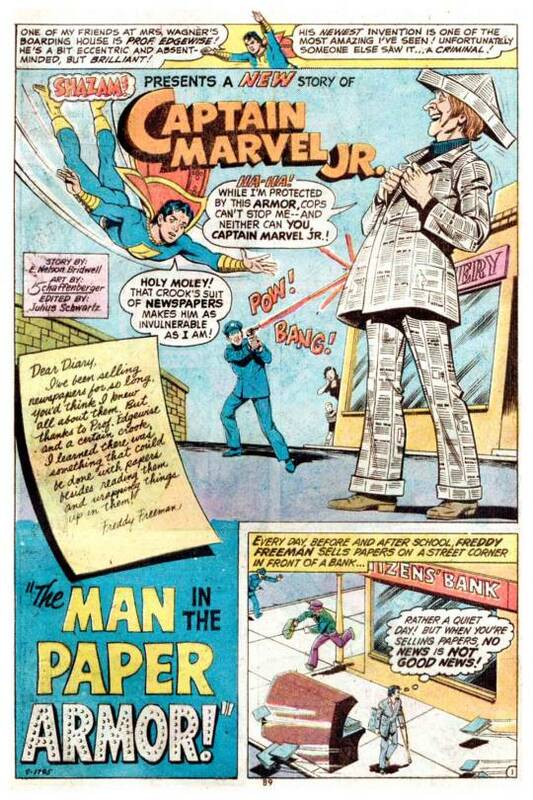 Finally, in the other new story in the issue, Captain Marvel Junior contends with a criminal who steals a formula that can make paper absolutely indestructible, and who fashions himself a suit of armor out of it. It’s a fun story, although it doesn’t really amount to much.